I am making chocolate covered Oreos for my sister's wedding. The wedding is only 2 weeks away. Can I start dipping the Oreos now, or is it too soon? How long will the chocolate dipped oreos stay fresh after they have been made? I think your chocolate dipped Oreos will be fine for 2 weeks. Chocolate covered treats have a surprisingly good shelf life for the most part. While you are storing them before the wedding, keep them in an airtight container so they don't absorb any odors from things around them and in a cool dry location so that they aren't subject to temperature fluctuations. Are you decorating the dipped Oreos too? We'd love to see your finished Oreo wedding favors when you're done. Take a few photos and add them to the site! Just send them to me and I can add them to this page. I've added an example photo of chocolate decorated Oreo cookies so those who aren't familiar with this fantastic treat can see what all the fuss is about. ;) Of course, you never really understand until you taste one for yourself! Congrats and best wishes to your sister! I hope the wedding is all that she's dreaming for. Does anyone know how to get the thick horizontal line on cake pops? Like the Kate spade ones. Not pipped with a piping bag? I think the reason you have had the trouble with the Oreos going soft is because they are only half-dipped. When they Oreos are fully covered in chocolate, it creates a seal that keeps the cookie fresher for longer. If you are only planning the half-dipped variety, you will definitely need to prepare the chocolate covered Oreos closer to the wedding date to keep them fresh. I hope they turn out great! Soft. I'm lucky I did not make them all I have to start over. I think they will be fine as long as you keep them in a temperature controlled environment. You don't want them to get too warm or cold as the fats/sugars will separate and leave discoloration. Hope yours turn out great! If we make Chocolate Covered Oreos on May 13th will they still be good on June 25th? Unless it is absolutely too hot in your house to leave the chocolate Oreos at room temperature, that's exactly what I would do. When you put them in the fridge or freezer, you run the risk of discoloration from condensation, bloom, etc. There is no reason why they shouldn't stay fresh for 3 or more weeks if they are kept in an airtight container at a moderate room temperature. I'm in the tropics, so room temperature can be tricky, but for most people it should be ideal. If you are making these Chocolate dipped Oreos for a special occasion and are planning to individually wrap them in little cellophane favor bags or something similar, you can go ahead and put them in their wrappers and then place them in an airtight container. That way you'll be completely finished ahead of the big day. How far in advance can I make chocolate covered Oreos, and what's the best way to store them safely? 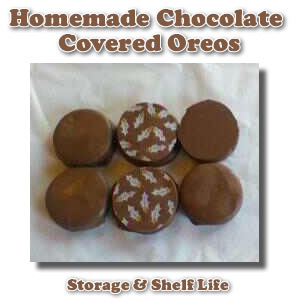 How long can I safely store chocolate dipped Oreos to keep them fresh? Due to my schedule I am looking at making them about 3 weeks in advance. Can I store them in the refrigerator all that time or should I freeze them? And how exactly (Ziploc bags, storage container, etc)? Or are all out of the question. Please help soon!